Ithaca is part of the Ionian Islands and situated off the west coast of Greece. With an area of ca. 96 square kilometres and only about 3000 inhabitants, the lush Ionian island offers ideal conditions for a relaxing holiday on the trail of the famous Greek hero Ulysses. This Greek gem is easy to get to by ferry from the larger neighbouring islands of Lefkada or Kefalonia. Its mythological roots make Ithaca the perfect place for long excursions to the legendary landmarks of the Greek island, with a beautiful view of the Ionian Sea from practically anywhere you go. An absolute must is a trip to the archaeological sites, the ruins of Ulysses’ palace, they say. The pretty and colourful houses along the seafront of Vathi, Ithaca’s capital, are best enjoyed during the ferry crossing to Ithaca. During the summer months, a crowd of sailing boats shelter in the large natural harbour of the Greek island. Another attractive aspect of a holiday on Ithaca is its high recreational value. The water is crystal clear and perfect for snorkelling, and what could be more inviting for hiking or just relaxing than large areas of green county-side with olive groves and cypress trees? For those in search of evening entertainment Ithaca offers romantic cafes and taverns serving traditional Greek food and doing their utmost to make sure that tourists have the time of their life. The Greek island’s raw and unspoilt nature forms a contrast with the tidy little villages that are well worth a visit too. Daytrips from Ithaca to the nearby Ionian islands of Kefalonia and Lefkada are also very popular. For those who seek relaxation as well as variety, a holiday on Ithaca is the perfect choice, and once hooked, you will always want to return. Anogi is a quiet little mountain village that lies on the slopes of Mount Neritos, about 10 miles from Ithaca’s capital of Vathi. Although there are only approximately 100 inhabitants and nobody really goes there, Anogi is worth a visit for the sake of its impressive church. Dedicated to the Virgin Mary - the Panagia - , it is one of the oldest churches on the island and has beautiful byzantine frescoes. Another place of interest in the little mountain village is the Venetian Campanile at the main square, like the byzantine church another instance of history leaving its mark. The scenery is very impressive too, with bizarre rock formations a sight for people with imagination. The most famous rock is called “Arakli” (Heracles) and is 8 m tall. Whilst Anogi is great for a day trip, staying there is not recommended. Frikes is one of the small harbour villages on the island if Ithaka in the ionian sea. The small village has been built around its rather sizeable harbour which is surrounded by several bars and tavernas. Frikes is predominantly a village popular with yachts and boating people. During daytime Frikes is a very calm village ideally suited for people looking for ultimate tranquility. Once a ferry arrives or the harbour gets filled with yachts, Frikes awakens again. Regardless if you are making it to Frikes by sea or by land, the village is worth spending a few nights. In the south-west of the Ionian Island of Ithaca lies the picturesque village of Kioni. Situated between rolling hills in a quiet bay with crystal clear water, Kioni has an exceptionally beautiful harbour that is ideal for an evening stroll as the road by the harbour is closed for cars. Kioni has a population of only about 200, but gets very busy in the summer when countless yachts anchor at the harbour. It is also a favourite destination for tourist boat trips during the peak season. If you can avoid the busiest time of the year, Kioni can be enjoyed at its best. There are two pebble beaches at about a 30 minutes’ walk from the village, and the entrance to the bay is guarded by the ruins of three windmills. There are many cafes and taverns in Kioni where delicious traditional food is served. According to Homer, Stavros is the town from where Ulysses set sail for Troy. The sedate little town, once upon a time the island’s capital, lies in the vicinity of the bay of Polis in the mountain region of Neritos and Roussano. There is no evidence to prove that Ithaca really was the home of Ulysses, except for a fragment from a clay mask with the inscription: ‘Dedicated to Ulysses’. A bust commemorates the site where it was found. Although Stavros was a cultural and social centre in former times, there are now only about 300 people living there. The centre of the town is the comparatively large ‘Platia’, the town square, with a cross-vaulted byzantine church. A few nice cafes and restaurants invite passers-by to sit down for a rest, and a small park provides some shade against the midday sun. Those who want to go to the beach have to make their way to the nearby bay of Polis, but further afield there are much more attractive bays on Ithaca. Stavros also has a museum with the aforesaid fragment, and outside Stavros near a village called Pelikata the hill can be found where, according to archaeologists, the palace of Ulysses used to be. 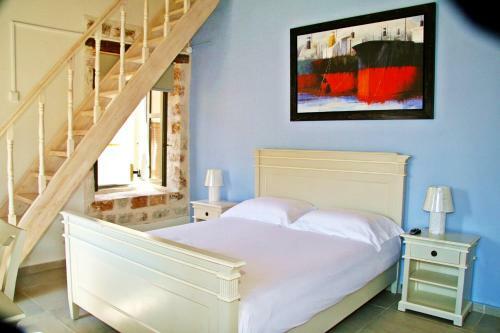 Vathi is the capital of Ithaca and can boast one of the most beautiful harbours in Greece. 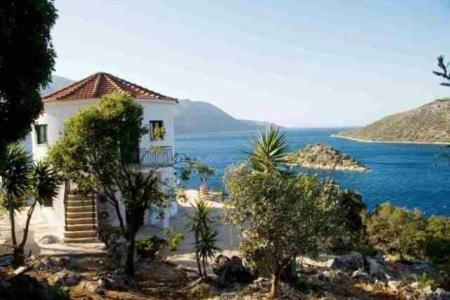 Surrounded by vineyards and olive groves, Vathi harmoniously blends in with the tail end of the gulf of Molos. The beautiful capital’s houses are lined up along the crescent of the bay, there are small pebble-beaches outside the town for those who fancy a swim, and the promenade along the harbour is perfect for an evening stroll. In the middle of the lagoon, the small island of Lazaretto with its church juts out of the water. The disastrous earthquake in 1953 has done a lot of damage in Ithaca, and very few buildings escaped the fate of being reduced to rubble. Everything has been carefully rebuilt. If you are staying on Ithaca at the end of June, you must not miss the theatre festival where a lot of well-known Greek artists perform. Another worthwhile site is the Archaeological museum. Accommodation in Vathi is no problem, as there are sufficient hotels, guesthouses and apartments.